In the recent decade the Similan Islands have lost a lot of its pristine character, mainly due to overfishing and global warming. But they still offer interesting and exciting diving, are home to thousands of species, some of them endemic, and continue to amaze divers with their dramatic underwater landscape and marine megafauna. 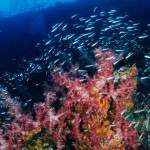 The combination of steady and predictable weather and sea conditions with visibilities constantly ranging around 30 meters / 100 feet and the highly developed and modern infrastructure on mainland as well as the abundance of dive centers and diving boats makes it still one of the worlds top diving destinations. There are places where the diving is better, but these places are a lot harder to get to and it is generally a lot more expensive to dive them. 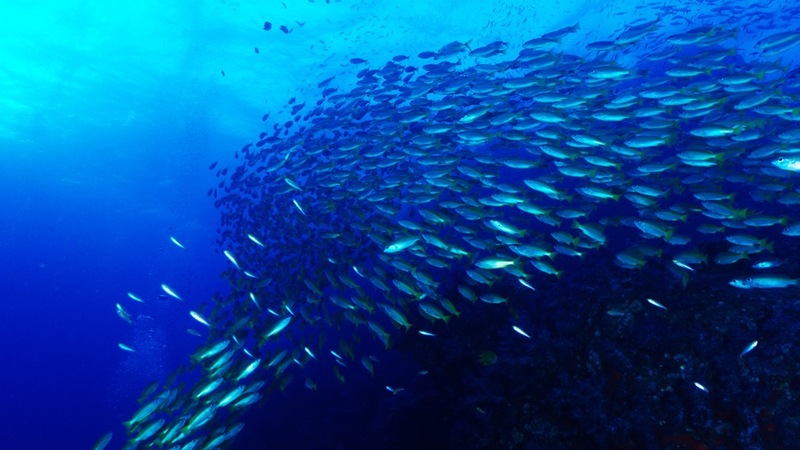 Especially for scuba divers in the experience group of zero to 100 dives, the Similan Islands can offer exceptional satisfying scuba diving. 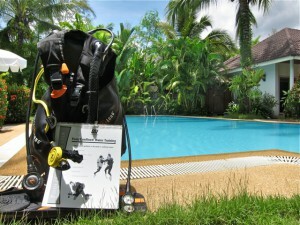 Very experienced divers still like the predictable and easy conditions, the landscape as well as the easy access. Phuket Intl. Airport is just a 45 minutes taxi drive south of the main departure port Tap Lamu. Similan liveaboard cruises alway include a day at the famous Richelieu Rock which still undoubtedly ranges in the Top 10 dive sites of the world and offered regular whale shark sightings in 2014. 19. Jan 2015: Since 2012 the Similan Islands see a phase of cold water upwellings from the deeper ocean, providing excellent conditions for coral growth and marine megafauna appearance. The shallower reefs above 10 meters / 30 feet are still affected by the 2010 coral bleaching event, but below 15 meters / 45 feet, the corals are healthy, diverse and fast growing. It is therefore advised to visit the underwater realm of the Similans with scuba gear as snorkelling can be somewhat dissapointing. If you have the choice, the definite anser is: Liveaboard! There is an array of reasons, starting with the price per dive, the value for money, the visited dive sites and the general operation. If you have only time for one or two daytrips, forget the Similan Islands themselves and head up north to either Koh Tachai or Richelieu Rock as these two dive sites offer the healthiest coral reefs and the highest chance of encountering marine megafauna. 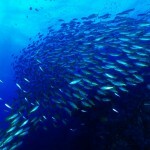 The easiest of all dive sites is located on the eastside of Islands #5 & #6. A gentle sloping reef with sandy bottom streches approximately 300 meters from south to north with some dramtic granite boulders on the southern end. 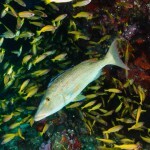 Don’t spend too much time in the shallows and seek the deeper parts around 20 meters / 60 feet. Interesting species here are the garden eels, the longnose hawkfish, cruising tunas and trevallies, giant moray eels and kuhls stingrays. Pygmy pipehorses have been found on the southern part at a depth of 18 meters. 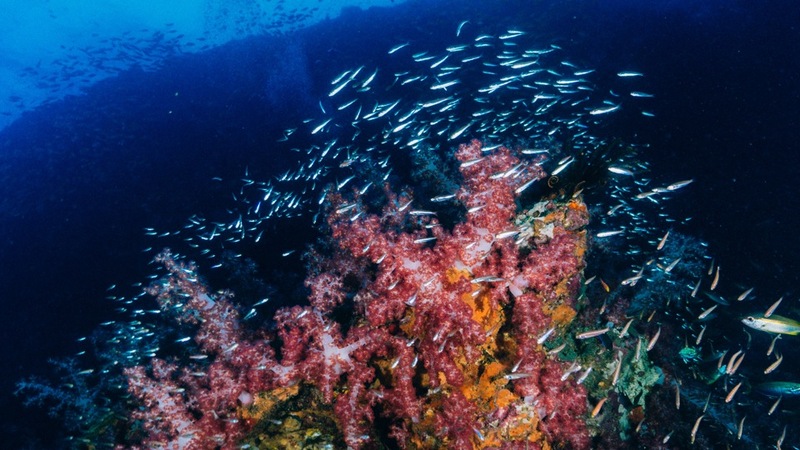 The first highlight and one of the best dive sites in the Similan Islands itself, West of Eden is the rocky western part of Island #7 where abundand healthy hard and soft coral gardens as well as huge fan corals await you in the deeper parts of the dive site. Spearing and boxing mantis shrimp are hunting their prey while hawskbill turtles are swimming next to the reef in search for food. Schooling fuseliers and goat fish make prey for some bluefin trevallies, you can also spot your first spiny painted lobsters and some clown triggerfishes. 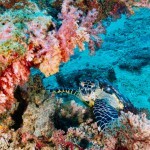 Watch your no-deco time as the most beautiful parts of the reef are well below 25 meters / 75 feet. The rocky northern tip of Island #7 is exposed to tide currents and the outcropping rocks create confusing whirls. This brings excellent conditions for a lot of species, white tip reef sharks are cruising off the north tip around 35 meters and some deep coral patches hold surprising density of life. Watch out for currents! Located right between Island #7 and Island #8 this stack of boulders is very exposed to tides, waves and currents. 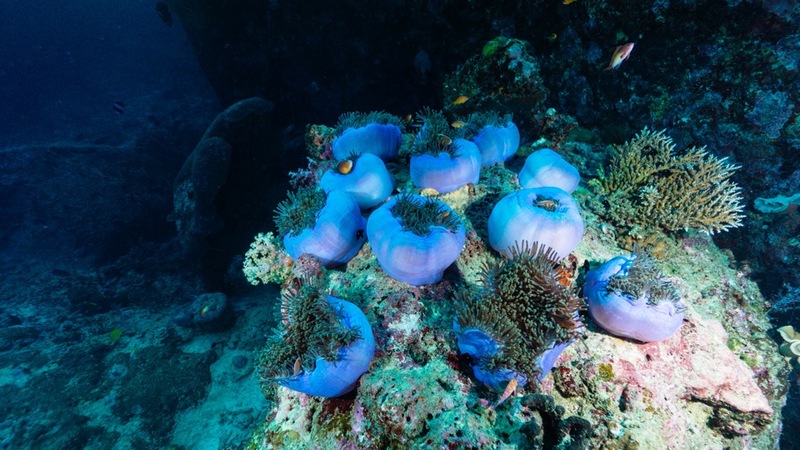 Although the main attraction of this site is the breathtaking setup of huge granite boulders stacked on top of each other, the marine life doesn’t dissapoint either. McCoskers flasher wrasse, porcelaine crabs, sea moths and various blennies are just some of the hosts in the deeper coral patches. 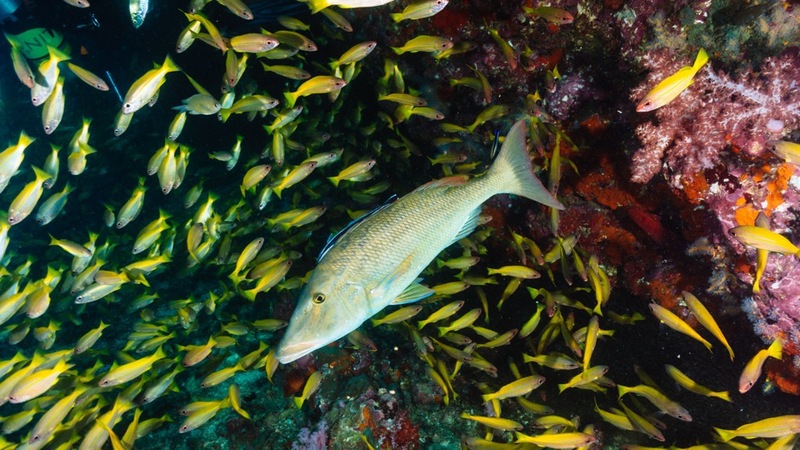 Dramatic swim throughs full of sweetlips, snappers and soldier fish have to be passed to get onto the north side where sometimes megafauna species circle around. Usually done as a sunset or night dive on day one of a diving safari, this site is located just off Donuld Duck Bay on Island #8. The convenience of beeing nearby a sheltered anchor place for the boat is the main reason for it to be on any cruises schedule, though recently a pair of black frogfish have been found in the shallow parts. 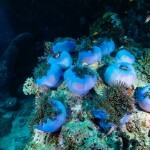 Usually chosen as first dive on the second day of a liveaboard cruise, these dive sites aren’t very special, apart from the reason that they lay on the northernmost point of the Similan Islands chain. The shallow reef at a depth around 5 meters / 15 feet used to be one of the best snorkeling reef of the world, but at the moment it shows nothing but dead coral plus a reasonable quantity of reef fish. 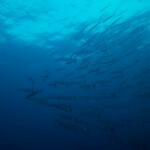 Octopus, hawskbill and green turtle can be seen here amongst some schooling barracudas. 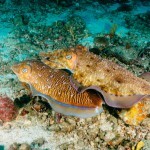 The morning light gives plenty of opportunity for some good underwater photography. The deeper parts are, like most of the similans, in reasonable good condition, but you don’t want to spend too much time there because the cruise will continue to..
All prices are rough averages and can vary depending on operator and cabin type. 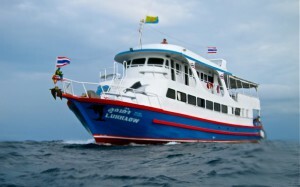 Also most of them don’t include the Similan Islands National Park Fee of about 60,- U$ per Trip per Person. Just one hour north of the Similans a solitary limestone island completes the scenery, with its sharp ridges sticking right into the tide flow, so special currents occur which regularly attracts giant manta rays and recently even whale sharks. Without the appearance of megafauna repetitive dives on Koh Bon an be considered a little bit boring, but there’s is still the very different macro life on the limestone walls to discover which differes from the one beeing seen in the similans at a great deal. 300 meters south of the island a huge, dome shaped, granite boulder sticks its top up to 14 meter depth – right into the tidal current already accelerated by having to flow around the island. Koh Tachai offers intermediate to strong currents nearly all the time which makes it teeming with all sorts of marine life. Blooming coral gardens cover the north-west side and the top of the pinnacle, both soft and hard corals sharing the same substrate. 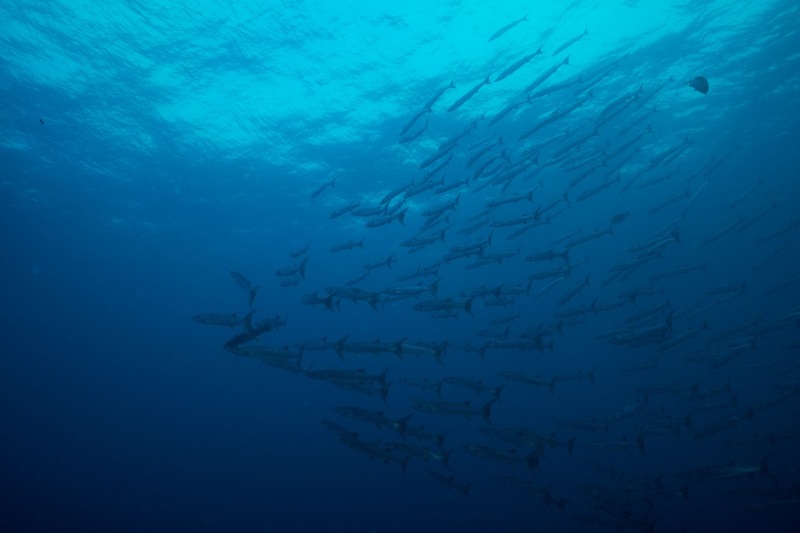 Giant trevallies break through a tornado of hundreds of giant barracuda to hunt their abundant prey consisting of myriads of fuseliers and snappers. Sweetlips and groupers are lurking between the rocks and prowling in the coral gardens, sea snakes yo-yoing their way to the surfce and back – one does not know where to look first! 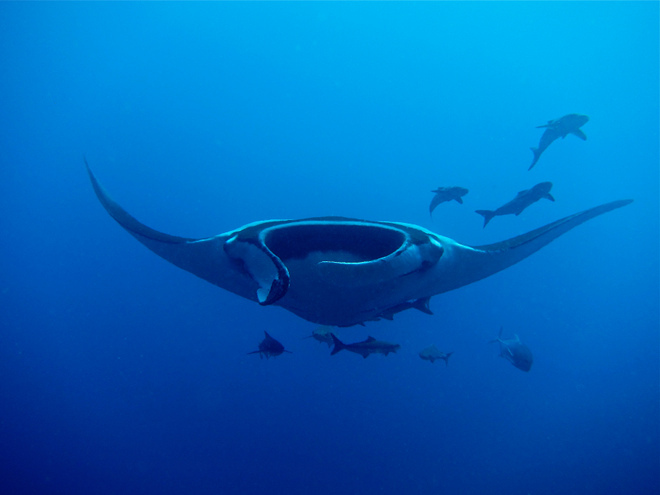 And as if all of this isn’t enough, Koh Tachai is famous for its whale shark and manta ray abundance. Although Richelieu Rock is considered to be the best dive site in the area, ask any member of dive staff which one’s their favourite dive site and the answer will most likely be: Koh Tachai Pinnacle! Beware of currents, they often change during the dive! Every Top 10 list of the worlds best dive sites includes Richelieu Rock somewhere between rank 3 and 7. Enough said? Ok then: seven nautical miles east of the Surin Islands a solitary limestone rock breaks the surface of the ocean about one meter in low tide and is completely submerged in high tide. Officially part of the Surin National Marine Park no Similan Liveaboard adventure is complete without a visit to this magnificent hotspot of marine life. 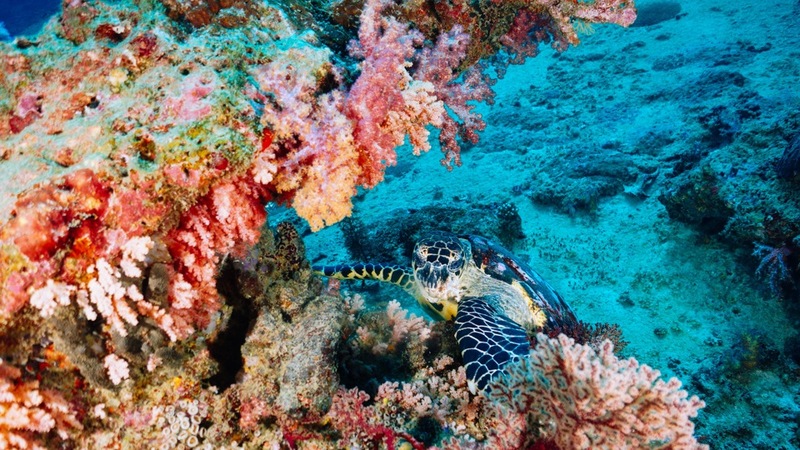 every square inch of the rock is literally alive and the interesting species list ranges from harlequin shrimps over seahorses, pipefishes, cleaner shrimps, constantly mating cuttlefish to eagle rays and whale sharks. The horse-shoe shape of the rock makes it diveable even in the stronger currents, the only problem that regularly plagues divers are high waves which make drop-in and pickup situations uncomfortable. Waves generally occur during december and at the end of April, but any constant wind situation can produce waves as the seafloor around the rock rises making it easy for the winds to build up reasonable wave heights. With its stable conditions and various dive sites, the Similan Islands are a perfect place to learn how to dive for people who want to experience not only the new world of scuba diving but also want to explore some underwater and marine life. Some dive site set-ups with slight currents makes it also a perfect place to continue diving education to the Advanced Open Water Course. Both skill levels are best learnt on a diving safari as this immerses the student fully into the diving world for a couple of days without distractions and the hassle of daytrip operations. 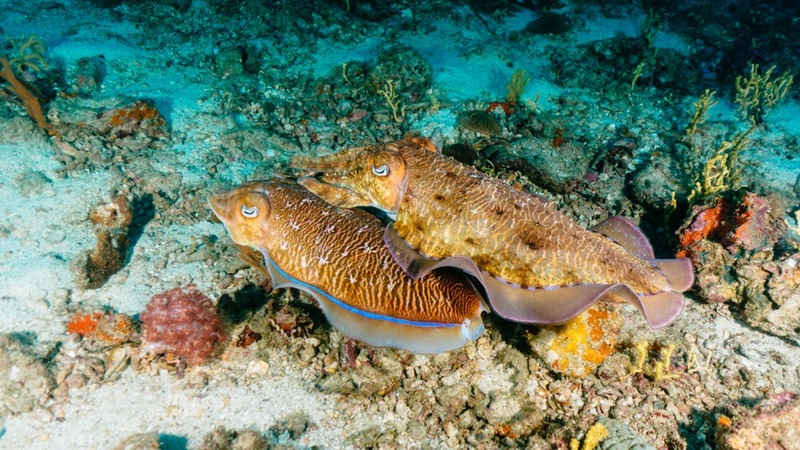 Unlike most popular places to learn scuba diving in Thailand, the Similan Islands offer many marine creatures to bee seen during training dives what makes students often forget, that they are participating in a diving course. Prices for an Open Water Scuba Diving Course start at 350,- U$ for two daytrips. The preferred option, boarding a safari dive boat and conducting a course on a cruise between the islands will cost the trip itself (between 700,- and 1000,- U$) plus the course fees of around 300,- U$. In the late 1980s and early 1990s the first divers were exploring the Similan Islands mainly on chartered and private leisure boats. In the late 1990s the first scuba liveaboards visited the islands on a regular basis. Among them a handful of five-star luxury steel boats and already a few local wooden liveaboards which were mainly converted former fishing boats. Around the 2000s the diving industry saw its first peak with daytrip speedboats departing directly from the lively Khao Lak beaches and an increased number of Phuket operated liveaboards. 1999 the first diving centers were opened in Khao Lak by a number of german, english and swiss expats and the traditional wooden local boats started to dominate the scene. After the Tsunami the diving industry faced a very hard time which lasted only a short while because in 2005 many divers were willing to return back to find the divesites, though affected by the tsunami in several ways, but the marine life and diversity still blooming and amazing as ever. 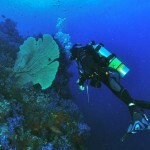 From then on “backpacker liveaboards” was the main market segment, with very few options for more demanding divers left. The former premier liveaboards (namely the OCEAN ROVER, the MERMAID and the ANGGUN) left the area for Indosiean diving grounds after the Tsunami and the increase of local boats and number of divers in the water. In the summer months of 2010, a backdraft of El Nino (also know as La Nina) hit the Andaman sea with water temperatures around 34°C for several months. 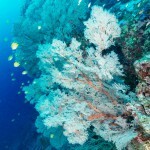 As a result almost 95% of the corals in 0 to 15 meters depth bleached and eventually died. The first divers who jumped into the water middle October 2011 couldn’t believe their eyes when they saw the snow white bleached reefs. Especially the shallow snorkel reefs of Breakfast Bend, North Point and Anitas Reef presented a sad sight all in white and nearly no reef fish. 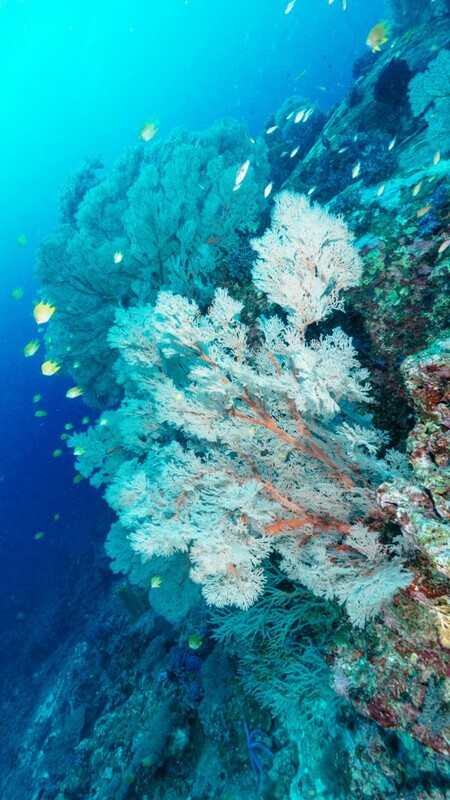 In the following months the white color disappeared as the dead coral were overgrown by algae. Surprisingly the diving industry saw no effect on tourist numbers at this point. 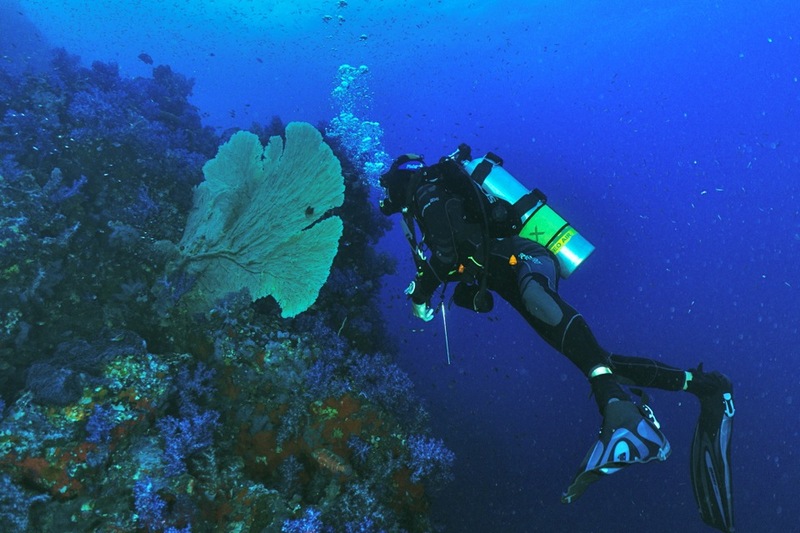 Only the experienced divers who dived the Similans before started to avoid these dive sites. Novice divers still came in great numbers taking advantage of the perfect learning conditions as the waters were still crystal clear and Koh Tachai and Richelieu Rock seemed nearly unaffected by the bleachings. Beginning of 2012 cold water upwellings from the deeper part of the oceans started to reach the reefs providing good conditions for new coral growth and by the end of 2012 young coral colonies used the old dead structures as their perfect new growing substrate to give life and color to the Similan Islands underwater realm once again.